The Future Stars curriculum is a two-level class. Students are evaluated throughout the year to ensure they are moving forward. Parents can track their progress using our online Skills Tracking in the Parent Portal! 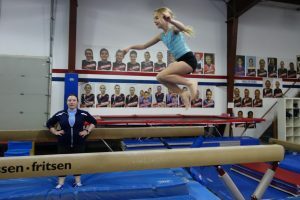 New to gymnastics? We offer a Future Stars 7+ class for beginners ages 7-10. This class is also ideal for girls who are not ready to move up to a Rising Stars class just yet. All Future Stars sign-ups get a FREE LEO on their first day!